L 46″(117 cm) Female L 37″(94 cm). Gobbling call can be heard from up to a mile away. Description: Large. Naked head with red wattles. Brown body with iridescent sheen. While displaying, male fans tail to show a wide black subterminal band and white or buffy terminal band. 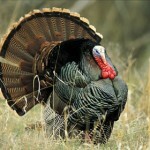 Males have spur and long tuft of feathers dangling from the breast called a beard. 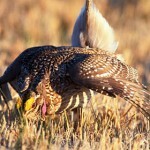 Female is smaller, duller brown, and usually lacks a beard. Habitat: varies in different parts of the state, but most birds are found in flood plain forests with a variety of deciduous trees. Preferably the trees produce acorns or other large seeds. 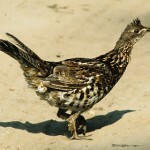 Where in Nebraska: Once extirpated from Nebraska, Wild Turkeys have now been re-established as a permanent resident in many areas, including the Pine Ridge area and along major river systems. 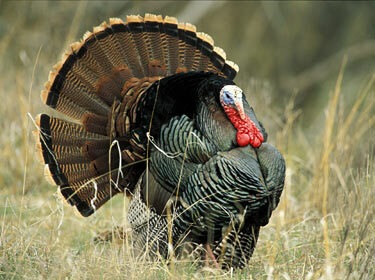 Fun Facts: Benjamin Franklin suggested the national bird should be the wild turkey instead of the bald eagle. Today turkeys can be found in every state except Alaska.